« Irish in Gaza back in Gaza! Ferdinand the Bull and the Butterflies of Gaza. The children, Fahad, Reema, Rewan, Islam and Hazim along with some of their siblings and other family members came to listen to Ferdinand the Bull. They sat giggling on the floor and sofa’s until the music and story began. 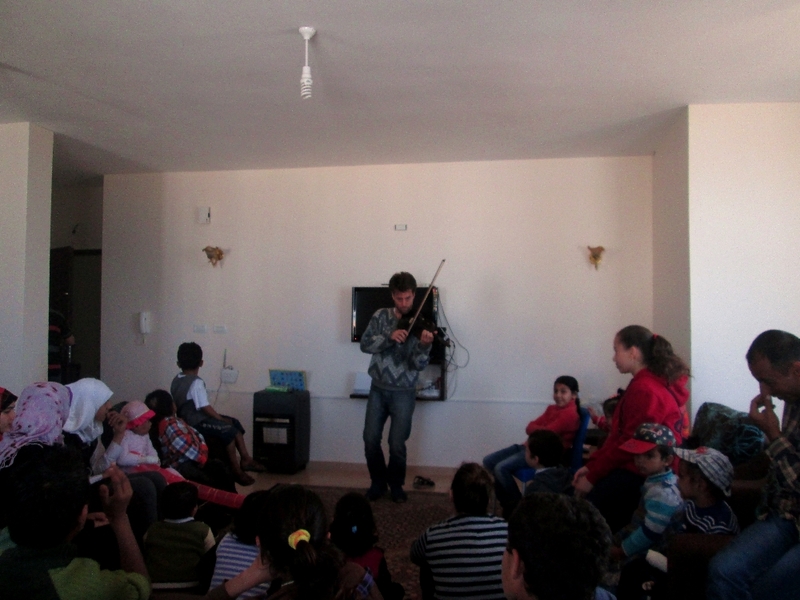 With each note, the children became more enthralled, the violin enticing them more and more in to the story, With Christian interacting with the children, waiting for their response, the giggling subsided and within moments, each child was lost in his wonderful music. There was no more difference between the 5 sick children and all the others, as the story , the music , joined hearts and minds and childhood. Epidermolysis Bullosa (EB) is an illness that causes the skin to be fragile. Because the skin is so fragile, it can be easily injured, causing painful blisters to form. These blisters can cause serious problems if they become infected. Some people with EB have a mild form of the disease with few blisters. For others, there may be many blisters on the skin. Some people develop blisters inside the body—in places such as the mouth, stomach, esophagus EB skin is never able to ever heal properly with normal strength: chronic open wounds and extensive scarring develop with attendant pain. Each time EB skin is damaged, the damage is irreversible, and disfigurement and disability accrue over a lifetime. Some severe forms of EB are fatal in infancy; others in older children and young adults. The chronic wounds of EB can result in decreased mobility owing to pain and the extensive scar tissue that forms. Scarring in turn results in constriction of the mouth or throat, or ‘mitten’ deformities of the hands and feet: benefits of surgery to release fingers, for example, are of limited duration as scar tissue starts to form again immediately. For some types of EB, the internal mucosa is also affected: nutrition can be compromised, resulting in osteoporosis, and general failure to thrive: quite young children can depend on gastrostomies or require highly specialised diets. A type of skin cancer, squamous cell carcinoma (SCC), is a major cause of death for recessive dystrophic (RDEB) teenagers and young adults: surgery, radio- or chemotherapy are not effective. It is particularly aggressive and invasive in EB patients and the need is to prevent development or slow the spread. IN GAZA… Here in Gaza, a lack of fresh, unsalted, un polluted water to clean the children’s wounds adds to an already extremely painful, crippling and often fatal illness. A shortage of bandages to cover exposed and open wounds, and a dire shortage of funds exacerbates the pain the children go through on a daily basis, but despite all this, these are some of the sweetest, friendliest children we have the pleasure of knowing. In Gaza, there is now a small association helping the children and families effected by EB, thanks to Daniela Riva and her determination to fight for the children and her undeniable love for each of them. An association from Italy, Debra Italia, part of the Debra International group, are assisting with some of the medical needs for the children, sending delegations of Doctors to perform surgery at times on some of the children, The local association try to have different activities for the children, days at the beach, parties etc to give the children a social side and a chance for interaction with other children. Some of the children have now started school. They each attend clinics regularly to change bandages, have treatment, physiotherapy etc. These children, Fahad, Reema, Rewan, Islam and Hazim have never known a day without pain. On this day alone, Fahad could not walk due to new large blisters on his feet, Hazim came to the party direct from Shifa hospital after having a new, infected blister bandaged on his fore arm, but through daily adversity, they smile, always , they smile, laugh and humble those of us honoured enough to know them. Reema struggled to her feet to take centre stage and sing a song, Islam , supported by Dani, insisted on joining in with the dancing and Rewan mingled, chatted and posed for the pictures. If you would like more information on the Association in Gaza or would like to donate to the children, just contact us here and we will put you in contact with Daniela or the Association members.